As an Eco Nuts distributor, Green Team is pleased to accounce the addition of Eco Nuts’ new natural ammonia bouncer. Ammonia Bouncer specifically for Cloth Diapers! A special treatment for diapers affected by ammonia. 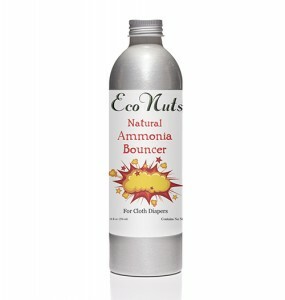 With plant-derived ingredients, Eco Nuts Ammonia Bouncer neutralizes ammonia odors on contact. Simply add 1-2 tablespoons of Eco Nuts Ammonia Bouncer to a small basin or sink of water and scrunch diapers to make sure the Bouncer touches every part of the diaper affected by ammonia, then launder as per usual. A strip prior to the treatment is recommended to remove any residue that may prevent the Bouncer from contacting ammonia. Join our “Green Team” as a retailer today in order to purchase Eco Nuts along with many other product lines. This entry was posted in Blog and tagged ammonia bouncer, cloth diaper laundry, cloth diaper odor eliminator, Eco Nuts, new products. Bookmark the permalink.